24 April 2017 1.30 – 4.30pm. The Mere Court Hotel, Mere, Nr. Knutsford. 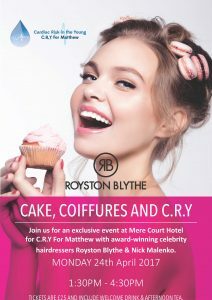 Come & meet Royston Blythe & Nick Malenko for ‘Tales from the Salon’. Lots of other fabulous treats for you along with a Prosecco Afternoon Tea. Tickets on sale: £25 per person.